You're back? Good. Here we go. I love afternoon tea. And if anyone ever suggests an afternoon out, I cross my fingers and toes in the hope that it might involve a spot of tea and cake and, more importantly, freshly baked scones. Crispy on the outside, light and fluffy in the middle. Slathered with jam and clotted cream. In that order. No butter. My mother is horrified by this. The maternal side of the family (my grandma's side) hail from Devon. Real Devonshire people put the cream on first and then the jam. With butter underneath. 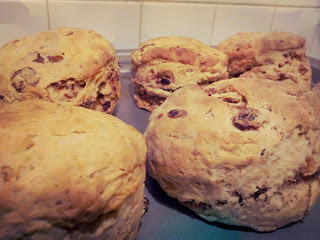 I'm an outcast for making my scones the Cornish way. Anyway, the rant. Who on earth thinks it's acceptable to eat fruit scones with butter, cream and jam on the top? I'm sorry, but it's just wrong. John Lewis do a very nice cheese scone, but if you want a pseudo-cream tea then the scone comes with sultanas in it. No thank you, very much. But it's not just John Lewis. M&S are at it, every single tea-serving place in the whole of Northumberland was at it (I had a scone craving during a holiday there a few years ago and ended up baking my own before we'd even unpacked the car when we finally got home). The husband took me for afternoon tea at the Ritz to celebrate my first twenty-ninth birthday. And even they were at it! Although they did very kindly take back the offending scones and give me plain ones. I'm sure that's only because the husband has "Lord..." on his Amex. Fruit scones should be buttered and eaten as is. That is the point of a fruit scone. That you can taste the fruit. The flavour of plump, juicy sultanas should not be sullied with more sticky-sweet fruit piled on the top. Do you put jam on malt loaf? Or a hot cross bun? Or maybe you do and I'm the odd one out here with my fruity-scone-butter-but-no-jam pecadillo? Anyway, I will not be eating these scones with anything other than a smear of butter. Mostly because you would lose the delicate scenting of tea and the complex fruit-and-spice flavour from the mincemeat. I loved the idea of this recipe so much when I first read it last night that I had to try it out today. Every time I've opened the cupboard since Christmas, the first thing that's greeted me is a near-empty jar of homemade mincemeat, staring at me in the most accusatory manner for not finding something to do with the last few tasty spoonfuls. Well now I have! I adapted the recipe slightly as I had 200g of mincemeat left and so reduced the liquid by 50ml and it worked brilliantly. The mincemeat contained slivers of almonds which gave a lovely little crunch here and there and was packed with a variety of cherries, apricots and other mixed fruit, giving it a great flavour. I used my biggest cutter and got five and 'one for the dog' as my Grandma would have said. Baked for 20 minutes and they look, smell and taste amazing. Thank you so much Turquoise Lemons for sharing! 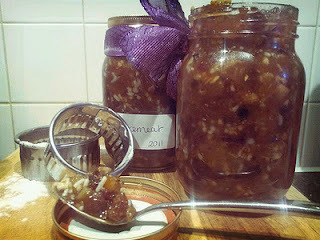 If you don't have leftover mincemeat just substitute with dried fruit and a teaspoon of mixed spice. Put the butter, sugar and flour into a large bowl and rub together until the butter is fully combined. Add the mincemeat and tea. Start to bring the mixture together into a dough. If the mixture is too dry, add a tablespoon or two of milk. Place on a floured surface, pat into a round approx 3cm thick and cut out your scones. Squash any cuttings back together and continue patting and cutting until all the dough is used. Remove the hot baking tray from the oven and place the scones onto it. 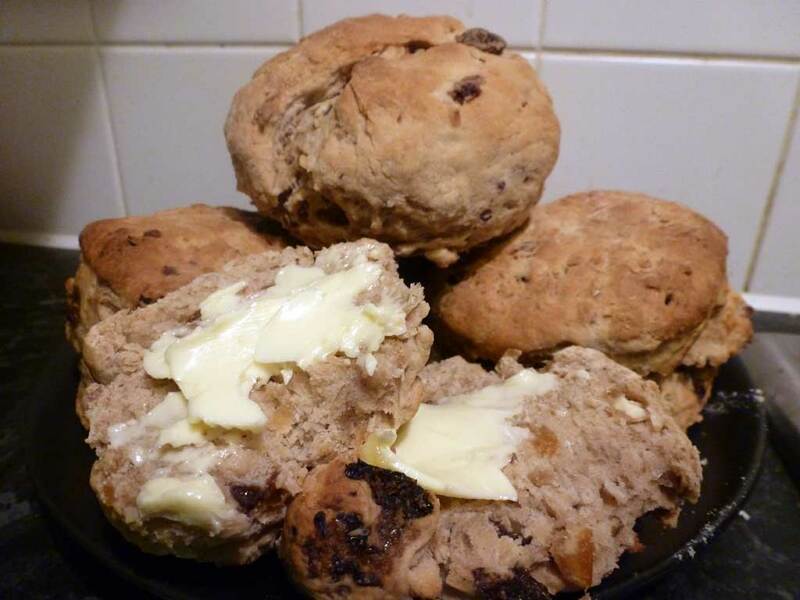 Brush each scone with milk or a little beaten egg. Bake for 15-20 minutes until golden brown and they sound hollow when tapped. *If you don't get the reference, we're a family of Southampton supporters (my great grandma moved to Hampshire before my grandma was born). There is nothing that would please a Saints fan more than Pompey getting relegated... Now wondering how many Twitter friends I'll lose over this comment! **Placing the scones on a hot baking tray gives their rise a kick start.